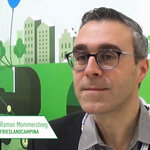 06 Dec 2018 --- At Health Ingredients Europe 2018 in Frankfurt, Germany, NutritionInsight spoke with Ramon Mommersteeg of FrieslandCampina about the company's dairy prototypes aimed at powering an active lifestyle. 13 Aug 2018 --- FrieslandCampina Ingredients highlighted the recent FDA opinion on dietary fibers, from which they could benefit them as a GOS (Galacto-Oligosaccharides) supplier. A prebiotic peach and apple white tea concept was presented, while high protein cookies with a chocolate hazelnut dip were also on display. Sarah Staley of FrieslandCampina spoke about GOS as a trending prebiotic fiber. “There is a lot of interest in clean, green and label-friendly ingredients and fiber is one that they are looking for, but in good tasting applications. This really means a lot more flexibility for formulators to offer something that has both prebiotic and fiber benefits,” she notes. 01 Oct 2009 --- It is one year since the merger of the two largest dairy companies in The Netherlands; Campina and Friesland Foods. Michael Erdl's thoughts on the marketplace and his opinions on innovation.